The Canadian becomes the youngest winner of the BNP Paribas Open since Serena Williams. The veteran vs the teen. The eight seed vs the wildcard. Angelique Kerber vs Bianca Andresscu. One year after Naomi Osaka was "California Dreamin" at the BNP Paribas Open, the Canadian was hoping to write some history to become the first wildcard to win the title. Kerber could write history herself, becoming the first German to win the title since the tournament became classified as a Premier Mandatory and the first German to win since 1994. 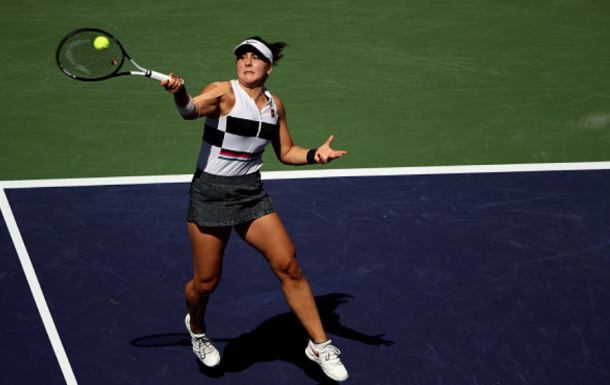 It was the young Canadian who stunned Kerber in a slugfest in the California desert to become the youngest winner of the title since Serena Williams back in 1999. Andreescu is now 28-3 on the year and will move up to a career-high ranking of 24. It was the perfect start for the 18-year-old Canadian, breaking Kerber and mixing up the pace she was throwing at the German. Kerber began to find her rhythm but still could not deal with the power Andresscu threw at her at times with the teen phenom finding some blistering aces and forehands down the line. The first game was the lone blip for Kerber who otherwise had played brilliantly in the set. Her only downside was that she just could not get into the service games of the Canadian even after winning the first point. After double-faulting for 30-all serving for the set, Andreescu came through with a huge first serve that Kerber mishit for her to put away easily. A clutch second serve out wide once again put her in prime position in the point and a forehand winner closed out the first set 6-4 to the Canadian. Another early service game from Kerber saw her in trouble with Andreescu lurking. The Canadian hit a phenomenal drop shot winner to set up break point, but Kerber dug in the next few points to hold for 2-1. The 18-year-old began to feel it physically. She noted in her prematch interview that she had treatment done the last few days after her grueling match against Elina Svitolina in the semifinals. You began to see more quickfire errors which likely had to do with her ailment. The anticipation from Kerber began to look better, understanding the Canadian's game more and more since this was their first meeting. Add that with the errors Andreescu was having, the momentum began to swing Kerber's way. Andreescu finally held once again for a second game of the second set, but she was really made to work to try and extend the set for 3-5 which she did. The Canadian had a slight opening at 15-30 but could not capitalize, slicing the ball into the net to send this match into a decider. Andreescu started the third set much better, holding in her first two service games including coming back from 0-30 to go up 2-1. On the changeover, the 18-year-old received a medical timeout for problems in her shoulder. The eighth-seeded German pulled ahead in the set by breaking in the fifth game. Andreescu called out her coach Sylvain Bruneau on the changeover and said that she could barely move. She really began to shorten the points and broke back with an overhead and forehand winner. The set turned on its head after the break back, winning the next three games to be able to serve for the match after breaking Kerber again. Two forehand winners quickly into the rally moved the Canadian two points from the match. Kerber had to make the teen move, and she did enough to force deuce from two match points down. The Canadian's drop shots were stunning throughout the day, but Kerber got to it and just guided it inside the line to save match point again. The lone break point chance for Kerber in the game was gifted after the 18-year-old played a poor drop shot with a whole open court down the line at her disposal. Another changeover where the trainer came out, and she worked on Andreescu's leg. Kerber still had to hold to extend the match, but the Canadian ripped a forehand winner to set up a fourth match point and took the match.